As many may know, Sea Watch Foundation works tirelessly to protect and conserve UK cetaceans. However, it’s not only those in the UK that need our help. Currently, a group of dedicated people are working to save a species on the edge – a small porpoise known as the vaquita. Vaquita is the most endangered marine mammal in the world with less than 20 individuals left. It exists only in the Sea of Cortez, Mexico, and was classed as critically endangered in 1996, and over the last year the numbers have decreased markedly. It is now in imminent danger of extinction, and the Government of Mexico has been advised to enact emergency regulations. Why is the vaquita nearly extinct? The easy answer to this question is it is due for the most part to illegal fisheries. Fishermen are using illegal gillnets to catch a fish known as totoaba. Vaquita become entangled in these nets, and cannot get to the surface to breathe. Why is the totoaba fish so desirable? In China, it is believed that if you eat a soup that contains dried totoaba swim bladders you will be rewarded with a healthy and glowing complexion. On the black market, totoaba fish can achieve $8500 per kilo of swim bladders. This problem has been ongoing for decades. 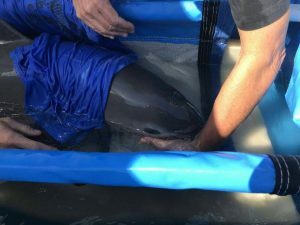 During the past month rescue attempts have been made by an International group of people known as, VaquitaCPR. This was a last-ditch attempt to save the species. Two animals were found, captured, and taken to a rehabilitation centre were the plan was to try to turn the tide around. Sadly, both attempts failed due to the animals suffering high stress levels during the rescue operations. The first individual was returned to sea, and sadly the second did not survive. It begs the question; is this species robust enough to survive capture, transportation and confinement in order to be saved? We are now aware that all rescue attempts have been stopped, and the only thing to save this species from extinction is an immediate and total removal of gillnets from the entirety of the vaquita’s range. Dr Lorenzo Rojas Bracho has been heavily involved for many years in trying to conserve the vaquita. To learn more watch this behind-the-scenes interview. Please visit: http://www.vivavaquita.org/index.html for more information. Here you can also make a donation which will go directly towards educational and advocacy efforts. For yet more of an insight into the problem, here is a presentation given by Dr Anna Hall, who has just returned from the Sea of Cortez to report her findings. Dr, Anna Hall talks about the critically endangered vaquita porpoise at the University of British Columbia's 25th Annual Marine Mammal Symposium.